So Krugman continues to argue that Friedman's calculations are implausible. Well sure. But that's the point to some extent as Galbraith discussed here. The Plan involves huge (read yuge; wink, wink, nudge, nudge) spending, and it should have almost by definition implausible results looking from the perspective of recent history. Imagine the implausible effect that Social Security had on old age poverty. Or the incredible reduction in inequality that the New Deal policies had. If you were in the 1930s, the historical record would suggest that an improvement in income distribution based on higher taxes on the wealthy and cheap college access to the masses would be implausible, and yet by the 1950s things had changed (see graph below). The historical record would say this was not possible. 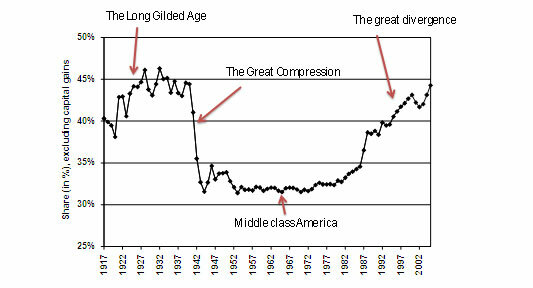 The guy that used the graph above said: "The middle-class society I grew up in didn’t evolve gradually or automatically. It was created, in a remarkably short period of time, by FDR and the New Deal. 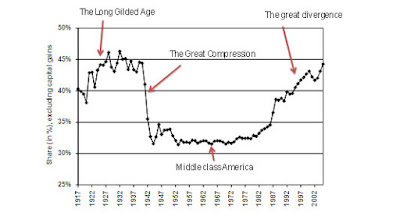 As the chart shows, income inequality declined drastically from the late 1930s to the mid 1940s, with the rich losing ground while working Americans saw unprecedented gains." Unprecedented, as in never done before, or implausible. Who said that? Bernie Sanders? Gerald Friedman? No, it was Paul Krugman of course. What Friedman calculates is what would be the effect of Sanders transformative policies in the real world using fairly conventional assumptions. More spending should lead to higher output, and employment. 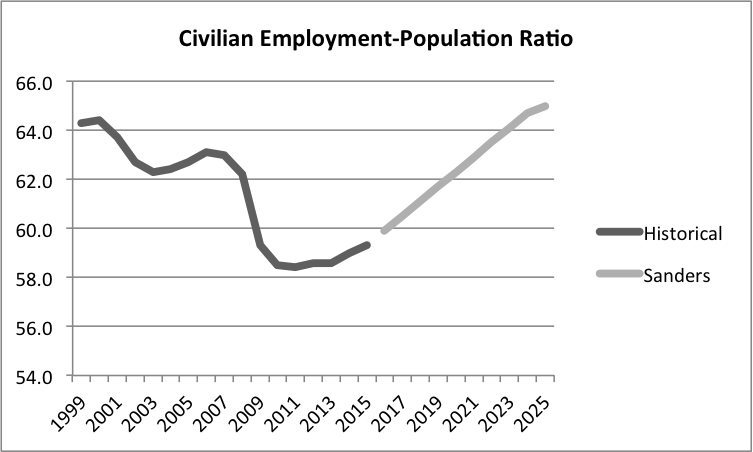 For example, Krugman has correctly complained all through the recovery what little impact the fiscal package had on the employment-population ratio. A huge increase in spending would basically look like the figure below (not from Friedman's data; but same result). So what Krugman calls implausible is the unprecedented fiscal expansion necessary to increase the employment-population ratio to the level he has been arguing it would need to be in a strong recovery. Krugman in the 1930s would have claimed that we shouldn't follow the pipe dreams of FDR and his implausible plans. We should probably stick with a Southern Dixiecrat that didn't rock the boat and implemented policies similar to Hoover. Electability is important after all. PS: That there is nothing implausible about health care for all is shown by the number of developed countries that have something like that, with government spending not much higher than the US. A reasonable increase in government spending would be of about 15% rather than 40% to achieve that. Great analogy. I don't know enough about the economic models underneath the discussion, but there are always limits to using history to model large changes. Several problems: Hysteresis effects from waiting too long and not doing enough stimulus right away? Fact we had a partial recovery, hole not as deep as it once was? Aging population? What innovations will be the source of increased productivity? Anonymous, the point is that nobody innovates if there is no demand. That's what Adam Smith said. And the evidence for Kaldor-Verdoorn is quite strong. Read for example David Landes Prometheus Unbound where he says how innovations in what part of the cotton textile sector responded to increased demand in another part. For example, no need for a cotton gin, without higher demand from England mills. So it's demand that determines productivity, not the other way round. Read the extensive number of posts on that in the blog.